For the most part, rock 'n roll bands have always had a reputation for being aloof, intense, and sometimes temperamental creators of angst-ridden songs. However, anyone with that perception of rock music has never encountered the guys in the Pakaderm/Myrrh group Guardian, one of Christian music's premiere purveyors of rock with a message. Well-known among Christian rock aficionados for such well-crafted albums as First Watch, Fire and Love and Miracle Mile, the members of Guardian have established a reputation for excellent musicianship. Through the powerful medium of rock music, they desire to convey what the Lord has done in their lives. Their new album, Swing, Swang, Swung is musically more diverse and lyrically more personal than any of their previous efforts. Each member of the band - guitarist Tony Palacios, drummer Karl Ney, lead vocalist Jamie Rowe and bassist David Bach - contribute their songwriting talents to the project, and the result is an album that is reflective of the musical personalities that make Guardian so unique. "I think if we had any agenda at all on the new record it was to be more open," says David Bach. "A lot of times rock bands have this aura about them that it's all very serious and somber. We're not like that at all as people. So we definitely tried on this record to let people know us a little better." Bach says the band members generally collaborate on songs for their albums, but instead of getting together to write as they usually do, they each wrote separately for the new project. "These songs are from the individual writers in the band, so it's got a different flavor," Bach relates. "Our last record, Miracle Mile, was kind of a semi-conceptual theme, but Swing, Swang, Swung is reflective. These songs are a little bit more introspective and less of the macho swagger that's always been associated with rock bands. These songs are more personal and more revealing. It's a reflection of what God has done in our lives." Musically, the album is a departure from Guardian's [previous efforts. "It's a change in direction but it was more of an unintentional change," Bach admits. "We had always wanted to make an acoustic EP. We sat down last winter and started writing, and all these songs came out. Our record company really liked the songs, so instead of it being just a little acoustic EP, it turned into a bonafied record. It's kind of a change in direction for us, but a very natural change. This is more of an acoustic flavored record. There's still some drums and bass and loud stuff, but it's definitely not a hard rock record. It's been a natural progression in our sound." "People tend to really think of rock bands as one-dimensional sometimes," Jamie Rowe adds, "and it's nice to show people we're not a stereotypical rock band." Karl Ney agrees. "I think true Guardian fans will appreciate this album," he says, "and I think we'll make new fans of people who just thought we were heavy metal. They'll see we're more diverse. We just like to have fun with the music." The roots of Guardian's sound lie in the Los Angeles rock scene where the band landed their first record deal in 1985 with Enigma/Capitol and recorded their debut album, First Watch. They negotiated a release form their Enigma contract and instead of going with another secular label, Bach and Palacios opted to sign with Pakaderm, a small Christian label where they worked with the Elefante Brothers to create the critically-acclaimed Fire and Love. "We felt really led to sign with a Christian company where we'd be at home creatively and spiritually," Bach recalls of their move to Pakaderm. "Ironically enough, after we were able to wrangle a release from our contract, four months later Enigma filed bankruptcy. So it was really amazing to us that God led us out of some potential trouble. 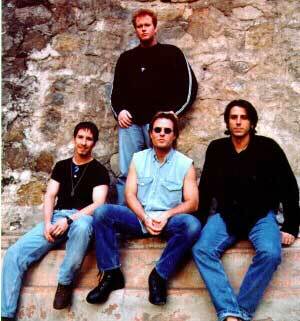 We signed with the Elefante Brothers on Pakaderm in 1990 and added Jamie Rowe and Karl Ney to the band." Bach, Rowe, Ney and Palacios have been together ever since. "Here we are now with Swing, Swang, Swung in 1994 with the same line-up and I hope it never changes," Bach says. "We've been through so much with each other the past five years, world-wide touring and many things. We really feel if Guardian has any charm it's in our chemistry. It's a chemistry which makes Guardian have a very personalized sound. When I think of all my favorite bands, to me, the essence of what excites me in music is usually the chemistry within a band that makes the music personal." Never has that sense of brotherhood and special Guardian chemistry been more evident than on Swing, Swang, Swung. The songs on the project cover a wide range of musical territory from the down-home acoustic blues stomp of the opening cut "Way Home Back" to the infectious "C'mon Everyone," both penned by Palacios, to Bach's poignant "Endless Summer" (which he refers to as his own personal Ecclesiastees) to Rowe's moving "Your Love" to the good-time anthem "Why Don't We," penned by Ney. Throughout the project a sense of passion and joy permeate each groove. The songs were definitely influenced by the relaxed atmosphere in which they were created. Since the Elefante's new super studio, The Sound Kitchen, wasn't completed, Guardian recorded Swing, Swang, Swung in John Elefante's small garage studio, affectionately referred to as the Snackbar. "It was a very loose, relaxed thing," Bach explains. "We cut (the record) in John's garage, which gave it a more personal nature. It doesn't really have a sterile studio feel. It was a very loose, vibey type situation." As much as they enjoy the writing and recording aspects of their career, the guys in Guardian love performing live for an audience and have toured all over the world. "That 45 minutes to two hours we spend on stage is the most rewarding time," Rowe states. "To get to see people smile and see them mouth the lyrics to our songs is a great feeling. To sit and write something in your room and then a couple of years later to have someone singing it back to you in Omaha or some other town, to know it touched them, is an incredible feeling." The members of Guardian are looking forward to seeing audiences react to the songs on Swing, Swang, Swung. "You always hope as a Christian that you're ministering to other people," Bach says, "and what was so exciting to us about this record is that God used our own songs to minister to us and showed us he cares about us as much as he cares about our listeners. That's what made this record such a personal, special experience for us - that God gave us these songs for us too."